YORKSHIRE have beaten title rivals Durham inside three days at Scarborough to move ever closer to retaining the County Championship. The visitors were bowled out for 263 shortly after tea, chasing 447 for victory, to give Yorkshire victory by 183 runs. 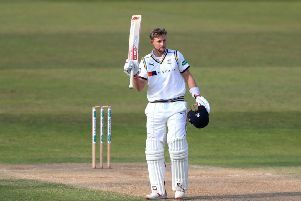 Yorkshire, champions in 2014 for the first time in 13 years, already held a 34-point lead over second-placed Warwickshire before the game began - which they have temporarily increased to 50 points - and with five matches still remaining they seem virtually uncatchable. After Durham resumed on 107-2 after lunch, they lost their third wicket in the second over of the afternoon session when Scott Borthwick was brilliantly caught by a diving Glenn Maxwell at third slip for 31. Plunkett took his third wicket of the innings with the score on 143 when he bounced out Gordon Muchall, who fended to wicketkeeper Andrew Hodd for 15. Michael Richardson and Jack Burnham, the 18-year-old debutant, added 53 for the fifth wicket in 17 overs before Richardson went lbw to Tim Bresnan for 48. Yorkshire then took two wickets on the stroke of tea, Adil Rashid having Ryan Pringle caught at mid-wicket by Gary Ballance for four, and Andrew Gale running out Jamie Harrison for a duck with a throw from cover. Durham were 220 for seven at tea and five runs later Hastings pushed forward at Rashid and was lbw, the leg-spinner in his next over getting Chris Rushworth to drive gently to Plunkett at cover. There was just time for Burnham to complete a fine maiden half-century by flicking Plunkett high over mid-wicket for four to bring him his eighth boundary after receiving 111 balls. The 4,400-crowd were entertained by some late fireworks from Onions who blasted Rashid for 18 in an over before Burnham mis-hit Plunkett to Gale for Yorkshire to complete their first double against Durham.